Flotation ’13 is set to be the biggest in MEI’s flotation series, with over 130 papers accepted for presentation in oral and poster sessions. The provisional timetable is now available for viewing. 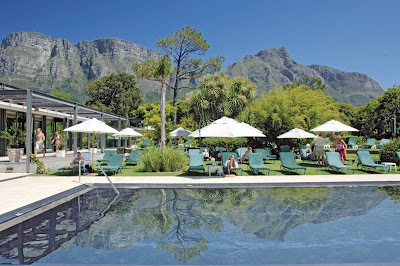 The conference also features dinner at the vibrant Cape Town Waterfront, wine functions, and three optional short courses on the weekend preceding the conference (full details in posting of 27th May). There is also the chance to take part in a guided hike up Table Mountain on the Friday following the conference. An event not to be missed if you have any involvement in flotation. We look forward to seeing you in Cape Town in November. There was a good turnout last night for the monthly mining sundowner at the Chain Locker pub in Falmouth. 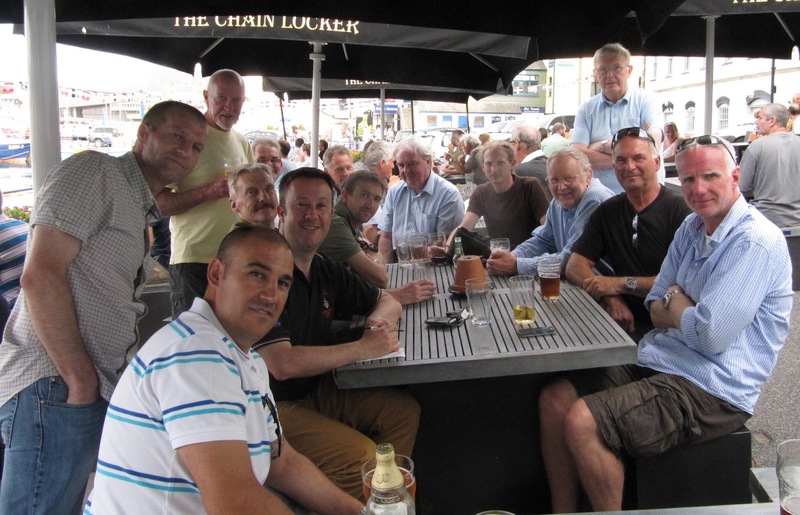 It was a beautiful evening, in contrast to last month's meeting where the regulars were joined by very wet delegates from the Physical Separation '13 conference. There are always new faces at the sundowners and last night it was good to see David Williams, who graduated from CSM in 1984, and a first appearance from King Edward Mine's Tony Clarke. Great to catch up with my old friend Bentley Orchard, formerly with FLSmidth, now with Weir Minerals Europe, and MEI's Biohydromet '14 consultant Chris Bryan, now firmly settled in his lecturing post at CSM. Like many youngsters in the 1950s, I was passionate about sport. We played football in the street in winter, and then swapped the heavy leather ball for the cricket bat and ball in the summer. Being a true Mancunian I was an ardent Manchester City supporter (the majority of Manchester United supporters have never set foot in Manchester!) and to play football for your favourite team was every boy's dream. In the 50s players would stay with one team for life, and many of the Manchester City team were local boys made good. But not all- my boyhood hero was Bert Trautmann, the German goalkeeper, who, like my Cockney father, had moved to Lancashire during the war, but for entirely different reasons. Trautmann joined the Luftwaffe early in the Second World War, serving as a paratrooper. He fought at the Eastern Front for three years, earning five medals including an Iron Cross. Later in the war he was sent to the Western Front, where he was captured by the British as the war drew to a close. He was transferred to a prisoner-of-war camp in Lancashire and after the war refused an offer of repatriation. Instead he settled in Lancashire, combining farm work with playing as goalkeeper for local football team St Helens Town. 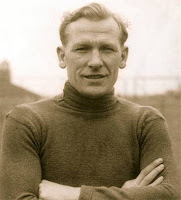 When his side played Manchester City in a friendly in 1949, Trautmann was so impressive that the first division side immediately signed him and wasted no time in putting him into their first team. The club's decision to sign a former Axis paratrooper sparked protests, with 20,000 people attending a demonstration. Over time he gained acceptance through his performances in the City goal, playing all but five of the club's next 250 matches. Trautmann entered football folklore in 1956 with his performance in the FA Cup Final against Birmingham City. It was not for any outstanding save on a day when City were generally in control, but for yet another example of his remarkable courage. With 15 minutes of the match remaining Trautmann suffered a serious injury after diving at the feet of Birmingham City's Peter Murphy. Despite his injury he continued to play, making crucial saves to preserve his team's 3­1 lead. His neck was noticeably crooked as he coollected his winners' medal; three days later an X-ray revealed it to be broken! Bert Trautmann was a heroic figure in every sense, and an inspiration to me, in that no matter what a person's background or circumstances, respect can be earned with self-belief and determination. Bert Trautmann died on July 19th 2013 aged 89. Metplant '13 was held at the Pan Pacific Hotel, Perth, Western Australia, from 14-17 July. It developed the themes from previous MetPlant conferences which encompass mineral processing, hydrometallurgy, biometallurgy, pyrometallurgy, water and tailings management, emissions management and energy efficiency. This year the conference concentrated on the practical matters of design, including feasibility studies, geometallurgy, process and equipment selection, construction and commissioning, and improvements to operations. The themes also included control and instrumentation, management strategies, green processing studies, and whole of life planning and operations through to closure and rehabilitation. The conference was attended by around 300 delegates, with 38 exhibitors, only slightly down on the record attendance at Metplant '11, excellent considering the current depressed state of the industry. It's good to see that the quality conferences survive, despite the ups and downs of the commodity market. The conference got under way in the late afternoon of Sunday 14th July, with the GD Delprat Distinguished Lecture on Flotation given by Prof. Graeme Jameson, Laureate Professor at the University of Newcastle, Australia. 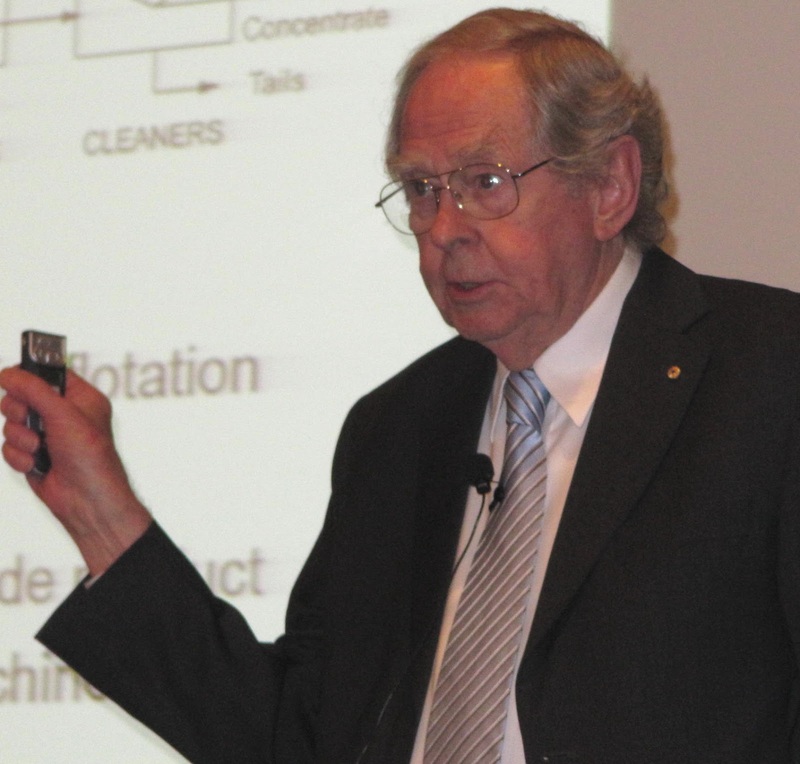 His lecture Size matters- coarse and quick flotation can reduce costs discussed the ever-present need to reduce the costs of mining and milling operations. It is well known that the largest cost in milling is the energy consumed in size reduction, particularly in grinding. Some progress has been made in reducing energy consumption in grinding, through better use of existing technologies, and the introduction of grinding methods such as high-pressure grinding rolls. However, most attention is usually given to the grinding operation itself, with little reference to downstream separation processes beyond a target grind size. Since flotation is widely used to separate the values from the gangue, the particle size distribution of the particles leaving the grinding circuit is generally determined by the known capabilities of conventional flotation machines. Existing flotation machines work very well for sizes typically in the range of 50 to 150 microns. If the upper size limit for flotation could be increased, by innovations in machine design, there would be dramatic reductions in grinding energy, which would lead to savings of great consequence for the running costs of the whole mining/milling operation. In his talk, the effect of the final grind size from the grinding circuit on the energy costs for a typical base metal concentrator were discussed, with reference to a simple grind/float/re-grind/float circuit. Potential savings will arise not only from the reduction in energy costs, but also in the media costs that are of the same order. The talk finished with considerations of the way in which the flotation process could be improved, to increase the recovery of coarse particles, using new and innovative technology, such as fluidised bed flotation. An important observation made by Graeme in his conclusions was that flotation researchers and comminution specialists should talk more to each other. He gave the example of MEI's Flotation and Comminution conferences which tend to have delegates dedicated only to each of these events. Flotation'13 and Comminution '14 will indeed be dominated by the leading international specialists in these fields, but I agree that interaction between these specialists is also needed. There are many good interdisciplinary conferences, however. 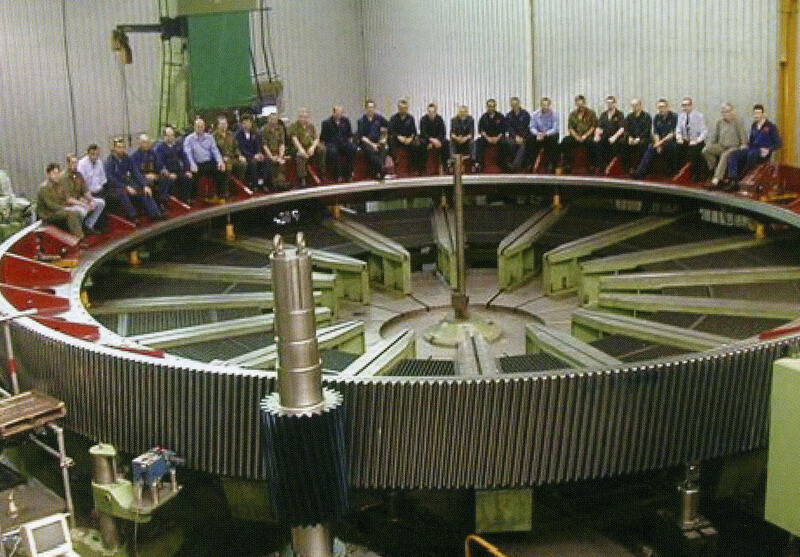 Metplant is one of them, the AusIMM's Mill Operators is another. Maybe some thought should be given to eclectic sessions at these conferences. Rather than grouping the sessions into specialist areas, it might be productive to have sessions with a mix of papers- a comminution paper, for example, being followed by one on flotation, then a gravity separation paper etc. This may lead to fresh ideas from people outside a particular specialty. What are your views on this? After a welcome from conference convenor David Pollard, the conference was officially opened by Michael Catchpole, Chief Executive of TheAusIMM. The first keynote lecture Is Bigger Better? Building market resilience into process plant design was presented by Peter McCarthy of AMC Consultants. In an environment of accelerating capital costs, limited capital availability and strongly cyclic metal prices, there is a difference between a robust mining and processing operation and one that would maximise shareholder returns in an idealised world. A higher cut-off grade policy is likely to improve operating margins and may reduce the scale of operations and thus limit capital exposure. This will leave some metal in the ground, but it is marginal material which carries the greatest cost and risk exposures. Where do we draw the line? 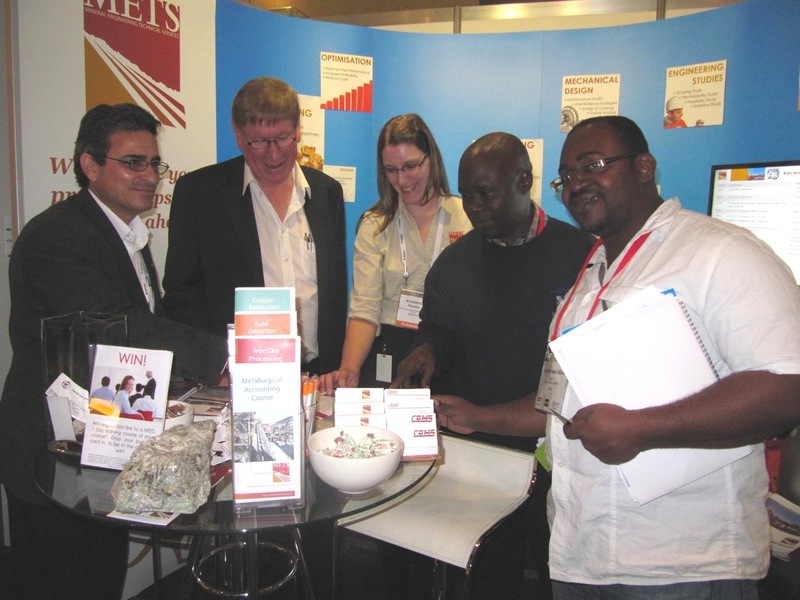 Outotec was the principal sponsor of Metplant '13. The company has grown its comminution portfolio substantially in recent times. Launched at MetPlant, the company has also added HPGR solutions to its portfolio (see also MEI Online) and now has one of the broadest ranges of competencies in comminution. Outotec's existing grinding technologies include AG mills, SAG mills, ball mills, rod mills, scrubbers and high intensity grinding mills. The recent acquisition of Scanalyse (MEI Online), which has developed proprietary computer analysis of spatial laser scan data to determine the condition of mill liners, is a valuable addition to Outotec's existing grinding services portfolio. Outotec presented an impressive five industry papers at MetPlant, covering high intensity grinding, industrial water treatment, flotation power optimisation, Outotec Ausmelt pyrometallurgical solutions and its latest innovative analyser, Courier 8. 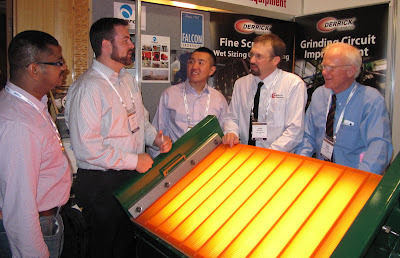 Graeme Jameson spoke yesterday of the need to reduce energy consumption in grinding, by grinding coarser. However, where fine grinding is needed to liberate values, new technologies have been introduced, notably stirred mills. Ilkka Roitto, of Outotec, showed this morning how stirred milling technology, already proven in many other industries, delivers a modern, sophisticated, flexible and energy efficient grinding solution for fine and ultra fine grinding in minerals processing. Stirred milling technology offers the unique possibility for online control and optimization of the regrind product particle size. Ilkka's paper described the basis of this online control possibility and discussed the implementation of stirred milling technology in minerals processing, particularly in regrinding applications. Sam Palaniandy of JKMRC also discussed stirred milling, in relation to Metso's VertiMill, around 420 of which have been installed in mineral processing plants, mostly in tertiary and regrind applications, several in secondary grinding duties. JKMRC has developed a VertiMill circuit survey protocol to evaluate the performance of the VertiMill in comminution circuits. Metso and the JKMRC have commenced a collaborative research program in stirred milling technology focusing on developing a VertiMill model for use in design and simulation studies. The survey protocol includes identification of sampling points, appropriateness of sampling tools, circuit stability, modification of sampling points and resources. With the ever increasing upper particle size limit of stirred mills, there is a school of thought that ball mills may well soon become redundant. Nevertheless the ball mill in closed circuit with hydrocyclones is an industry standard, and well known methodologies exist for equipment sizing, selection and design. However, the potential to improve the capacity of ball mill circuits by replacing cyclones with screens has been known for many years and recently has been successfully realised thanks to developments in fine screening technology. A presentation by Alex Jankovic of Metso discussed the differences between ball mill circuits closed with cyclones and screens. A methodology was described for equipment sizing and selection for a circuit closed with screens, and an economic evaluation also presented for a case study demonstrating the potential benefits of closing a ball mill circuit with screens. 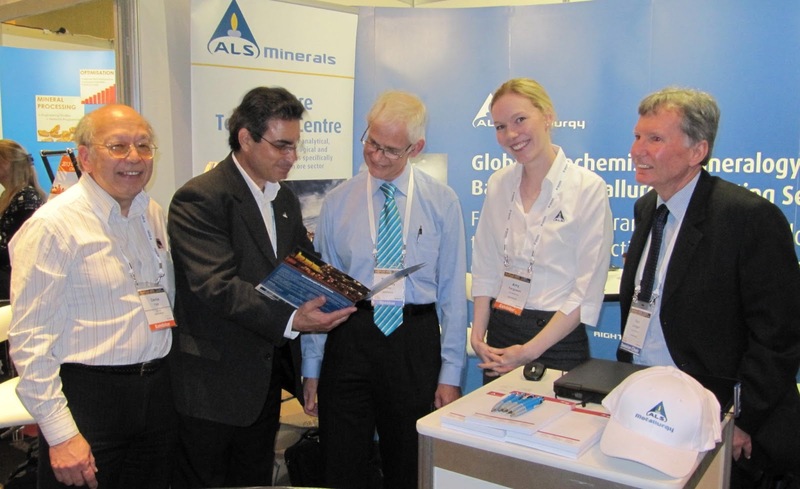 and The AusIMM's David Pollard (left). Judging by the level of interest in the Derrick screen exhibited in the Western Process Equipment booth, closing the ball mill circuit with such screens might delay the demise of the ball mill, particularly as these screens are now being used in grinding circuits with apertures as small as 75 microns, with claims for very little blinding due to the shape of the apertures and the unique screen motion. It is expected that screens with apertures as fine as 45 microns will soon be in operation for closing grinding circuits. The benefit of screens rather than hydrocyclones is the precise cut-size and avoidance of over-grinding of heavy mineral particles. Mill liners also contribute significantly to comminution costs and Dominic Connelly of METS discussed how the history of mill liners has evolved over time, in a paper which tracked the changes and development of liner technology. He provided an overview of the primary types of liners, the design and the materials of construction. Donhad is a company I have not heard of before, but since 1965 they have been providing many of Australia's largest mining companies with specialised grinding media and fasteners. Donhad is focused on continuous product research and development, closely supported by the resources of the worldwide Valmont Group. I would love to see them involved with Comminution '14. 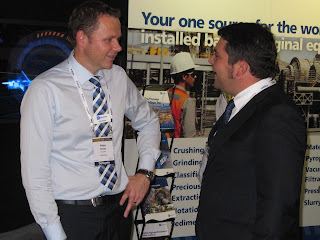 I found Trevor Robinson of Donhad talking to Ivan Popowski, Business Development Manager, Australia, of CITIC Heavy Industries, who are hoping to participate in Comminution '14. CITIC HIC is a global supplier of comminution equipment including grinding mills, crushers and HPGRs. Their main factory is located at Luoyang, China, with a total workforce of approximately 10,000 people of which more than 1,200 are professional engineers. 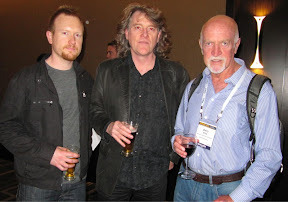 The great thing about conferences is catching up with old friends, some from way back in the past. So it was good to see Paul Piercy, who I last saw 42 years ago! 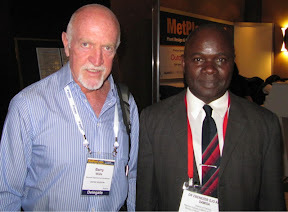 He was my first boss on the concentrator when I arrived in Zambia in 1969 (see posting of 25 November 2010). He left Zambia in 1971 and worked on various mines, firstly at Tennant Creek, then Bougainville Copper for 6 years and Hamersley Iron for 8 years. He has also worked in coal, and equipment manufacture and is now semi-retired. An excellent first day was rounded off with the Metso-sponsored conference dinner, which I greatly enjoyed, thanks to the good food and wine, and the great company at my table. It was particularly good to meet Robert Jenkins and his wife, Fiona. Robert was a student of my old pal Terry Veasey at Birmingham University. MIPAC senior systems engineer Tim Hausler gave a paper this morning on achieving success in large-scale, remote area metallurgical plant projects. The winner of the 2012 AusIMM New Professional Award, Tim shared his experiences of working overseas, specifically in Kazakhstan. The paper identified ways that engineers can improve their experiences while working abroad, including how to develop solutions to engineering challenges when collaborating with people from a variety of cultural and language backgrounds. He also addressed how to work effectively with translators, ways to cope with being away from home for extended periods and how to maintain contact with work colleagues at head office. A challenge on many industrial flotation circuits is controlling concentrate mineral grades using measurements that are provided infrequently. The mineral grades in concentrate streams are a critical performance indicator in any industrial flotation circuit. Failure to achieve concentrate mineral grade targets has significant financial consequences on a flotation operation. A violation of gangue mineral grade limits by the concentrator may also result in significant penalties. Online grade analysers which can provide reliable real time grade measurements are essential for effective grade optimisation. The Blue Cube MQi analyser has recently come to prominence for its ability to rapidly determine mineral concentrate grades online and has the benefit of operating in-stream. This has provided excellent insight into the actual process dynamics in the flotation circuit, and hence enabled real-time control and optimisation of concentrate mineral grades. Mintek's Measurement and Control division, South Africa, specialises in advanced control solutions and has had the opportunity to link the FloatStar Grade-Recovery Optimiser to the measurements provided by the Blue Cube system at the BCL nickel concentrator plant in Botswana, as discussed this morning by David Phillpotts of Mintek. The project focused on stabilising the final concentrate grade while ensuring the final tailings are minimised, resulting in an improved nickel recovery. With her outgoing personality and sharp mind, Diana Drinkwater is a great ambassador for Australia's JKTech. 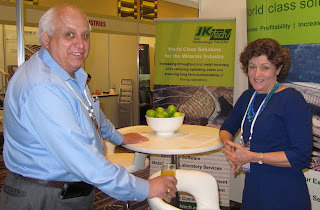 She is pictured talking to Steve Gibson, Senior Director of Pacific Consolidated Industries (PCI), of USA, a leading manufacturer of on-site Oxygen VSA technology, who are just breaking into the minerals industry. High levels of dissolved oxygen are essential to the gold/silver mining industry's leaching process. Increasing the dissolved oxygen level in gold / silver bearing slurry enhances the cyanidation process, as well as reducing cyanide and waste treatment costs. Steve explained to me and Diana how his company's commercial oxygen solutions offer the complete package: generation, storage, and distribution. Their equipment is fully automatic, easy to maintain, and produces a continuous flow of oxygen directly to the leaching tanks. We talked about showcasing this at next year's Biohydromet '14 conference in Falmouth. The smelting of concentrates and secondary materials has been subject to increasing challenges in recent years due to declining grades of feed materials, increasing impurity levels and ever more stringent environmental regulations. In addition there has been a growing focus on maximising the efficiency of energy usage and recovery of values. New opportunities have been created with rising metals prices and improved systems for the collection of secondary materials giving rise to a need for more flexible process solutions. A paper by Stephen Hughes, of Outotec, focused on a number of specific cases where a process solution has been developed using the Outotec Ausmelt Process to meet particular feed material challenges and overcome limitations inherent when employing traditional pyrometallurgical processes. 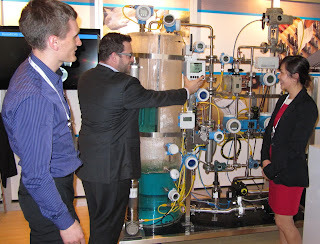 I catch up with Andrew Hawkey of Bilfinger Water Technologies at many conferences. He explained to me that the company is participating in Metplant as part of its mission to demonstrate that the Diemme Filtration GHT pressure filter is an environmentally-responsible, economically-viable alternative for mine tailings management. There are mow more than 300 of these units installed. In addition, the GHT-F configuration of this machine is proving to be one of the fastest concentrate filters available. It was also good to catch up with Tim Bell (right) and Nigel Grigg (centre) of Gekko, long term sponsors of MEI Online's Gravity Concentration pages. Gekko is a recognised leader in the development of new technology for the gravity, intensive leach and modular plant sectors. As an example, they have led a trend into low-capital non CIP/CIL gold plants and in the treatment of complex ores. Furthermore, Gekko is now installing the InLine Pressure Jig as a standard product into diamond operations. Ausenco is trying to showcase its engineering offerings at different levels at the conference, via three papers. Greg Lane, Chief Technical Officer at Ausenco, started the final day by delivering a keynote presentation on Project Delivery. Project delivery strategies are determined by a number of matters related to project context, business case requirements, scale of project, market conditions, client preference, contractor's experience, resource and skill availability, project location and type of project or facility. The paper dealt with one component of this in the mining industry context, project delivery strategies. For any given project there is a unique balance between selection of a simple project delivery strategy that minimises interfaces and a complex strategy that necessarily engages the use of expertise and experience from numerous parties. The balance between these "book-end cases" is a function of how the project owner or managing contractor defines its objectives and chooses to manage risk, cost, schedule and project quality, in the context of the conditions affecting the project. I called in to see Jeff Aston and his team at the Huntsman booth. Huntsman's Global Performance Products division has over 35 years experience in the mining industry and offers a number of products for mineral processing, with a specific focus on froth flotation and hydrometallurgy. Flotation reagents include frothers, depressants, dispersants, specialty amines and some specialty collectors. Over the last 5 years they have been increasing their involvement in the African Mining Industry and have been present at the last two MEI Flotation Conferences. They feel that the time has come for promoting a greater presence in the region and therefore decided to sponsor November's Flotation '13 in Cape Town. They are currently working with Protea Mining Chemicals, in Namibia and the DRC specifically, in developing the various opportunities for the supply of mining products, testing and application knowledge. This has been an interesting morning for flotation, with two papers from major machine manufacturers. Ben Murphy of Outotec discussed flotation power optimisation. Traditionally comminution optimisation has been focused on energy minimisation whereas flotation optimisation has been focused on recovery. One of the largest, if not the largest, operating cost over the life of a flotation circuit is power. With increasing pressure on operators to lower production costs and the cost of energy increasing, minimising the power consumption of the flotation circuit can be beneficial to site economics. The paper reviewed the use of power in mechanically agitated forced air flotation machines and looked at strategies to minimise it without adversely impacting product recovery. Sergio Vianna of FLSmidth discussed developments in Dorr Oliver flotation machines. A methodology has been developed to evaluate changes in flotation machine design in order to improve performance, particularly for forced air machines. Over 200-laboratory flotation tests were conducted, with over 100 design combinations showing improved recovery from the original Dorr Oliver design. 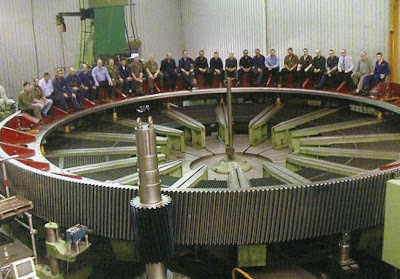 This resulted in the development of a unique mechanism design (rotor and stator) to decrease power and improve recovery. In addition, some designs have been identified to improve fine and/or coarse particle recovery. The need to float coarse particles efficiently was highlighted in Graeme Jameson's lecture on Sunday, so it was interesting to call at the Eriez Flotation Division (EFD) booth to see the company's product line encompassing coarse flotation cells, fine and ultra-fine flotation cells (column cells), gas spargers, mini-pilot plants, slurry distributors and flotation test equipment. EFD has made significant advances in coarse sulphide particle recovery using a novel separation system, the HydroFloat separator. The novel characteristic of this separator is the formation of a hindered "teeter" bed of fluidized bed medium into which small air bubbles are introduced. The primary benefit is the flotation of very coarse sulphide material (up to 1mm) that may otherwise be lost using conventional methods. Maybe there is a major role for such a machine within the grinding circuit, to minimise energy consumption? In closing the conference, convenor David Pollard invited delegates to Metplant '15 which will be held in Perth in September 2015, and to Mill Operators' Conference 2014 in Townsville in September next year. He also made the award of an AusIMM publication to Wei Ying Lui of Xstrata Copper, for best paper at the conference Mount Isa Mines Copper Concentrator- an insight into current and historical practice. But that was not quite the end of Metplant 2013. After lunch, around 30 of us took the tour of Hofmann Engineering's impressive Bassendean facility, which included the opportunity to witness the manufacture of 38'-40' diameter mill shells, HPGR rolls and large-diameter forged steel mill girth gears amongst a range of other specialised mining and mineral processing equipment. This really was heavy engineering on a massive scale, but to extreme levels of precision. Hard to believe that this is a family business, started in a tool shed in 1969! Although I have seen many large mills in operation, I have never really given a thought to how they are made, so this was an enlightening experience. As David Pollard remarked, this was like Swiss watch making on a huge scale! Many thanks to the three generations of Hofmanns for your hospitality- I have rarely been so impressed. I have really enjoyed Metplant '13 and MEI's involvement as a media partner; it was definitely worth the long journey from UK, and I will certainly be back for Metplant '15. The highlights for me were Graeme Jameson's flotation lecture on Sunday, identifying the need for an efficient flotation machine to float coarse particles in the grinding circuit, and the demonstration of Eriez's HydroFloat cell, which apparently can do just that. Prof. Jameson will be at Flotation '13 in November, and I hope that Eriez will also have a presence at this major conference to showcase their device to an international audience. It has also been great to meet up with old friends, particularly Paul Piercy, who I had not seen for 42 years, and to make new acquaintances. This is what conferences are all about, no matter what the quality of the papers. manufacturers, with relatively few operators, despite being in one of the world's great mining areas. This is no fault of The AusIMM, however, more a reflection on the state of the industry. But where were all the young people? 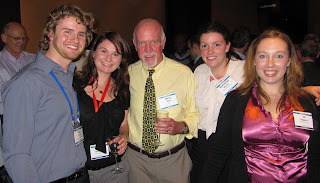 One of the things I remember vividly about Metplant '11 was the number of students, mainly from Murdoch University, all enthusiastic and keen to meet and network with the experienced members of our profession. And where were the academics, particularly from the local Murdoch and Curtin Universities? 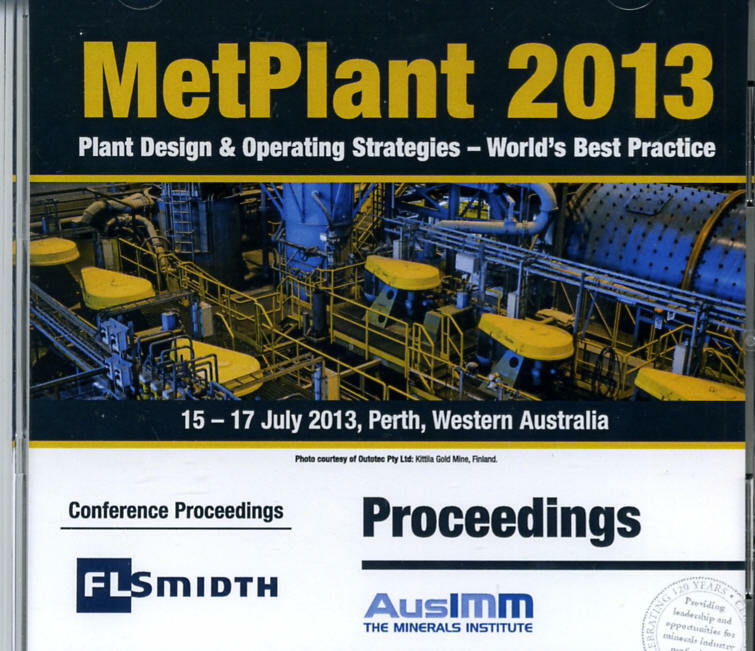 Forty nine papers were presented at Metplant '13 and these are available on the Proceedings CD, from TheAusIMM, price A$55. A final thanks to the convenor, David Pollard, and to Alison McKenzie and Tara Hicks, who work tirelessly and efficiently behind the scenes. I arrived in Perth shortly after midnight on Saturday morning, after a 31 hour journey from Falmouth. Sitting across the aisle from me on the BA flight to Singapore was Rob Morrison, from the JKMRC in Brisbane. Rob was at last month's Falmouth conferences, after which he and his wife Lindy toured Ireland and the Lake District. After the heat of Falmouth (yes, seriously) I had a pleasant day yesterday relaxing in a cool and sunny Perth, and spending a fortune on food, in what must be one of the world's most expensive cities. I called in at the conference hotel this morning to say hello to The AusIMM's dynamic duo, Allison McKenzie and Tara Hicks, who were hard at work preparing delegate packs for this afternoon's registration for Metplant '13. After registration there was a good turnout for Prof. Graeme Jameson's G.D. Delprat Distinguished Lecture on Flotation, an excellent talk which will feature in my report on Metplant next week. It was good to see many familiar faces in the audience, including Dr. Ebenezer Oju Aliu Damisa, of the Nigerian Institute of Mining & Geosciences, who was a mining student at Camborne School of Mines, graduating in 1985. 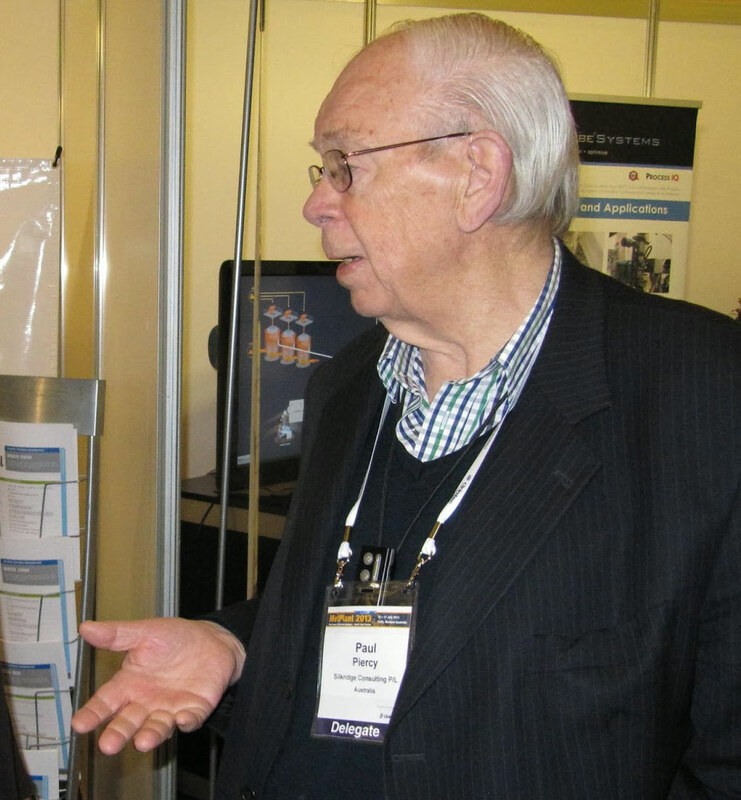 Also good to see Mike Adams of Mutis Liber, MEI Consultant to Precious Metals '14 and now an editor of Hydrometallurgy. He was accompanied by his son Jonathan, who has had 10 years experience in metallurgical testwork, now with ALS Metallurgy, and is also in his 3rd year in Extractive Metallurgy at Murdoch University, Perth. After a quick beer with Mike and Jonathan, it was back to the hotel to listen to the end of the incredible England v Australia Test Match from Nottingham, won by England by 14 runs in the most dramatic finish imaginable! I look forward to rubbing, sorry, discussing, this with the Australians at the conference tomorrow! While en route to Perth, I heard the disturbing news that Prof. Jan Miller and Dr. Xuming Wang, of the University of Utah, have been in a serious auto accident in Tibet. They are currently in the military hospital there. Xuming is recovering well from his injuries, which were not as serious as Prof. Miller's. Prof. Miller has been diagnosed with multiple fractures to his vertebrae in the cervical, thoracic, and lumbar regions, and clavicle and rib fractures. The plan is to stabilise him while plans are being made between the Tibetan government and related parties to transport him back to the U.S.A. It looks like he will need surgery once he returns to Salt Lake City. On behalf of MEI, I wish both Jan and Xuming speedy recoveries. 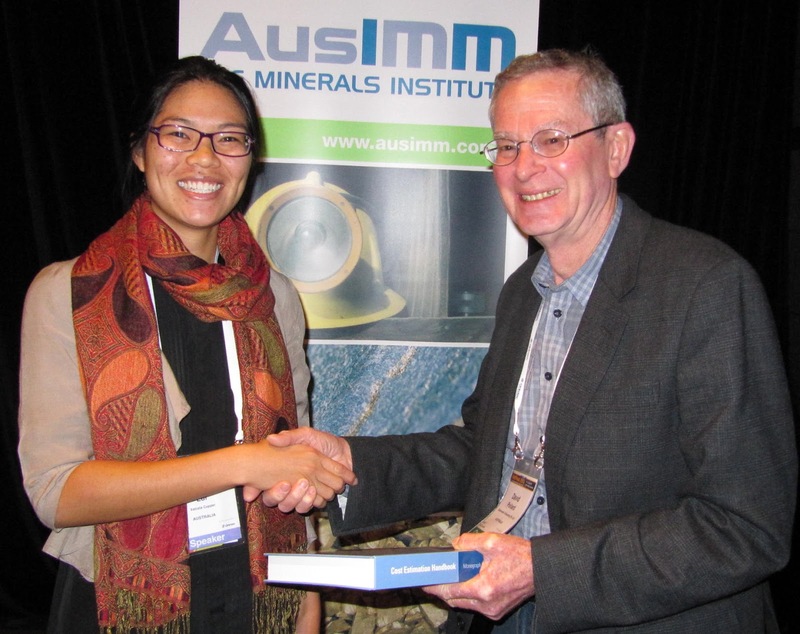 Xuming is a regular reviewer for Minerals Engineering, while Jan has been a long-serving member of the Editorial Board. I last saw him in Denver in February, where he presented the Wadsworth Lecture at the SME Annual Meeting, a follow-on from his excellent keynote lecture on x-ray tomography which he presented at Process Mineralogy '12 last November in Cape Town. 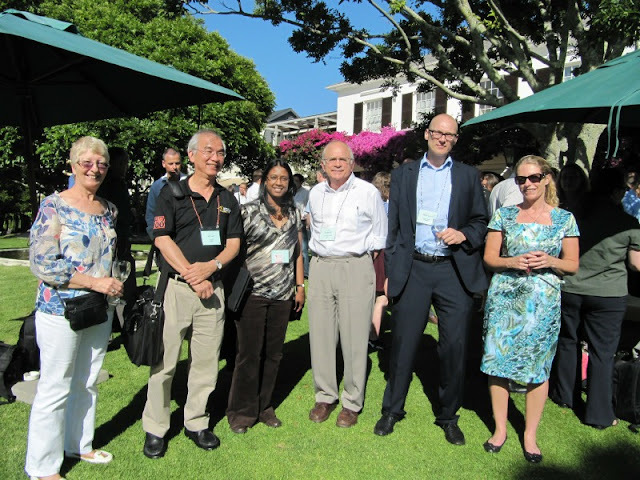 Prof. Miller is 4th left on the photo below, taken at Process Mineralogy '12. Best wishes to you both, from all the mineral processing community. 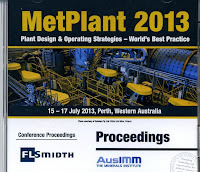 MEI is The AusIMM's media partner for Metplant '13, which starts next week in Perth, Western Australia. I will be providing a report on the event (see posting of 12 August 2011 for Metplant '11 report). If you are attending, and have any innovative news that you feel you would like to share, please contact me as soon as possible. I will be providing live updates from Perth on Twitter (@barrywills) and hope to have the report on the blog two weeks today. Look forward to seeing some of you in Perth. 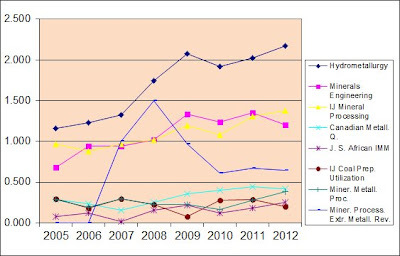 The 2012 journal impact factors have been announced (MEI Online) and I congratulate Kari Heiskanen and D.R. 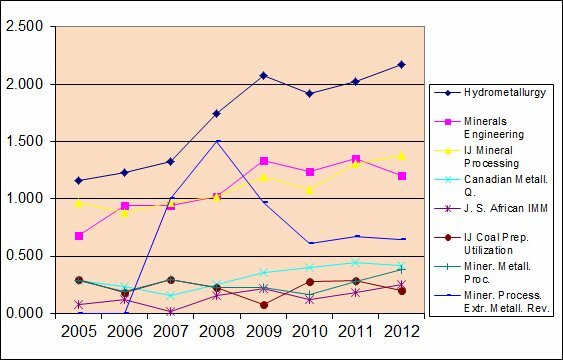 (Nag) Nagaraj, editors of International Journal of Mineral Processing (IJMP) on their impact factor creeping above that of Minerals Engineering for the first time since 2007. 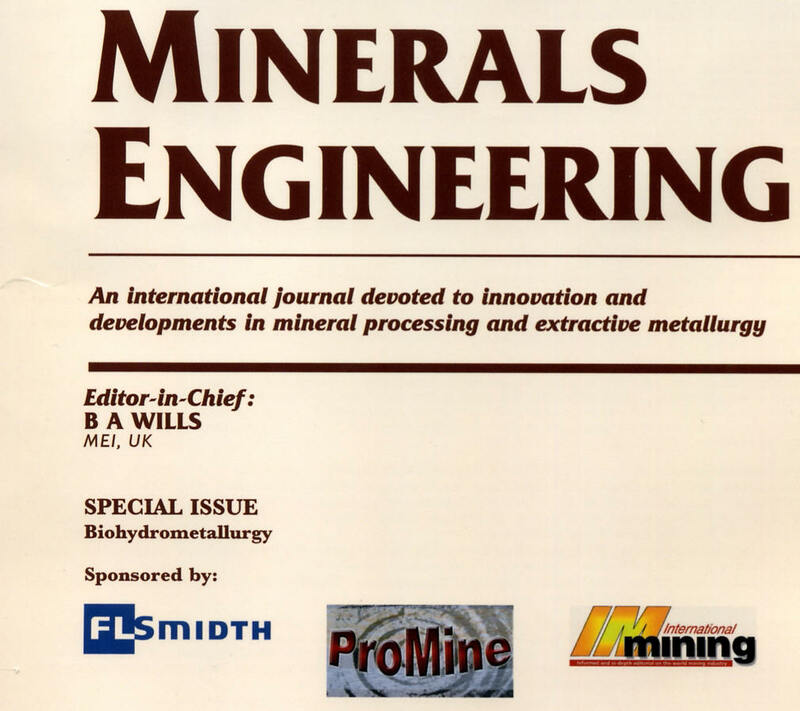 Of the three Elsevier mineral processing and extractive metallurgy journals, Hydrometallurgy retains its highest ranking, due to its highly specialised nature. Kari will be at Flotation '13 in November to present one of the keynote lectures, and Nag is co-author of two papers with his colleagues from Cytec, USA. 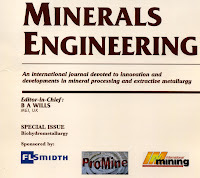 Eighteen of the papers presented at last June’s Biohydrometallurgy ‘12 conference in Falmouth, UK, have now been published in Volume 48 of Minerals Engineering, and the papers are available for downloading from ScienceDirect. The conference proceedings, containing unrefereed papers, is available on CD. A full list of the papers on the CD can be found by clicking here. The next Biohydrometallurgy conference, Biohydromet ‘14, will be held in Falmouth in June 2014, and again will provide speakers with the opportunity of presenting their work to an elite international audience, as well as having the opportunity of publishing the work in a leading mineral processing peer-reviewed journal. The conference will run back to back with SRCR ’14 at the same venue. This will be the theme of the keynote lecture at MEI’s Sustainability through Resource Conservation and Recycling (SRCR ’14) conference in Falmouth next year. It will be given by Prof. Markus Reuter, of Outotec Oyj, and Aalto University, Finland. 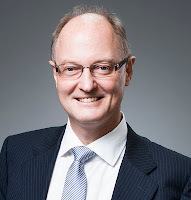 The keynote will summarise the UNEP report on Metal Recycling (UNEP 2013) and will discuss the depth and detail that is required to systemically fully understand resource efficiency in the context of material use in especially complex products. Metals are an essential and critical component of today’s society: a moment’s reflection on their ubiquitous presence in virtually all energy and material production processes, products, infrastructure, confirms this. Metals play a key role in enabling sustainability through societies various high-tech applications. However, the resources of our planet are limited, as is the strain to which we can subject it in terms of emissions, pollution, and disposal of waste. For these reasons, Prof. Reuter will show how ways to lower the environmental footprint of our collective existence and therefore lowering greenhouse gas emissions and help mitigate climate change is a vital priority. SRCR ’14 will discuss all aspects of metal and material usage (see the full scope) and will be run back to back with Biohydromet ’14 at the same venue. If you would like to present a paper at either of these conferences, abstracts should be submitted by the end of December.